Key Difference: Hair dryers or blow dryers are electromechanical devices that give off hot or cool air to dry hair quickly after a shower. The hair dryer is designed to give off the air to help accelerate the evaporation of water from the hair. Straightening Iron is a type of hair iron that is used to straighten the hair. These are also known has straighteners and flat irons. These irons are used to remove natural curls and waves from the hair and make it straight. Hair dryers and straightening irons are two different types of devices that are used in hair styling. Both of these devices serve different purposes. Hair dryers are used to dry hair, while the straightening irons are used to straighten hair and remove natural curls and waves from the hair. However, many people have also been able to effectively use hair dryers as straighteners by running a straight comb or brush through the hair while drying it from root to tip. Straightening irons have also been used as curling irons. These are two different devices, but their usage have become blurred over time. Hair dryers or blow dryers are electromechanical devices that give off hot or cool air to dry hair quickly after a shower. The hair dryer is designed to give off the air to help accelerate the evaporation of water from the hair. The faster evaporation also allows the hair to style and set quickly compared to air drying. Hence, hair dryers are a common feature of almost all salons and hair styling boutiques. After a wash, temporary hydrogen bonds form between strands of hair and are quite powerful and determine the shape and style of hair. Blow dryers also play a huge part in controlling these hydrogen bonds that shape the hair. These bonds are temporary and can be washed out. Hair dryers and blow dryers were invented around the 1890s by Alexander F. "Beau" Godefroy and were a part of his salon in France. It is said that Godefroy created the hair dryer by taking inspiration from a vacuum cleaner. These traditional hair dryers were huge and had a dome that was placed on top of the client’s head, which would put out warm air to dry and style the hair. Modern versions of such devices, known as hair hood dryers are still seen in some salons. The handheld hair dryers that are found in almost all households popped up during the 1920s and were used by beauty salons and professional stylists. However, the first patent for a blow dryer in America was filed in 1911 by Armenian American inventor Gabriel Kazanjian. 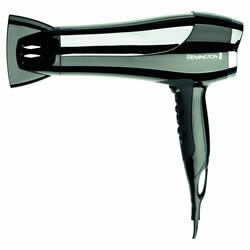 Hair dryers are made by using plastic with ceramic heating elements. The ceramic provides an instant heating capability, resulting in faster heating and drying time. The device has coils of wire with high electric resistivity along with a fan that is powered by a universal motor. The heating coils or ceramic heating elements provide the heat to heat up the air, while the fan blows the air out of the device. The devices are powered by electricity. The hair dryers also have a ‘cool’ button that does not provide heat but simply provides room temperature hair to reduce the frizz from the hair. Now-a-days, many dryers are available with various technologies such as ionic features, which are claimed to reduce static electricity between hair strands and make hair less frizzy and smoother. Hair dryers are also available with various attachments such as diffusers, airflow concentrators, and comb nozzle attachments. Straightening Iron is a type of hair iron that is used to straighten the hair. These are also known has straighteners and flat irons. These irons are used to remove natural curls and waves from the hair and make it straight. Straightening irons work by breaking down the natural hydrogen bonds between the hair strands. These bonds allow the hair to bend and be curly. However, exposure to humidity and moisture can result in the bonds to reform, which is why many people have frizzy hair when it is humid out. Straightening irons have a handle that is attached to two flat plates that heat up. These plates are more commonly made with ceramic as it heats up faster and is gentler on the hair. However, cheaper models have also been known to use aluminum plates. Higher end models use tourmaline, which uses negative ions and infrared technology. Ceramic plates are known to make hair slicker and shiner, as it provides a more even heating. This results in the less frizzy hair after straightening. The size of the plates can differ depending on the model purchased, with the standard size being one inch (2.54 cm). According to experts, when straightening hair, it is best to wash, condition and dry hair before straightening. Damp hair will also be fine during straightening but ensure that the temperature is on low or medium. Heat protective spray can also be used to keep the hair from becoming heat damaged. Many people have also perfected curling hair using straighteners, but it does not provide as prominent results as a curling iron.